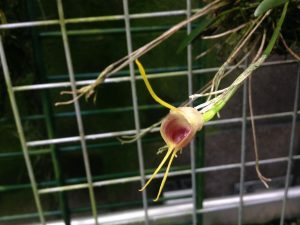 Masdevallia infracta comes from the Mata Atlantica cloud forests of Eatern Brazil where we have seen it growing in the same forests that support Cattleya coccinea (day 20). On our school expedition to Brazil in 2001 we helped with the relocation of a small population of this species from the underside of a recently fallen tree to nearby locations that may suit continued survival of the plants to set seed and support future generations. Flowers are produced successively over a long period from the top of the flower stems and so it is important to take care not to cut of ‘finished flower spikes’ that may go on producing for several years. 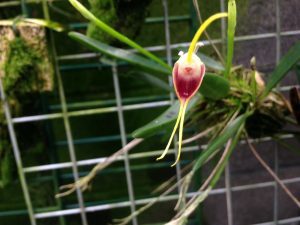 The shape of the flowers and the red colour indicate that it is probably humming bird pollinated. Our plant grows mounted in Cool Americas.